Donate in May to help CAGJ earn $5,000 Matching Grant! Every year in the Spring we rally our community to support CAGJ by pledging money or time. In celebration of CAGJ’s 15th anniversary, your membership gift to CAGJ in May will go twice as far, helping us hire a second organizer to confront corporate power and fight for food justice for all! Get your gift doubled today and double our staffing in 2016! $10,000 Goal to Hire New Organizer: Your gift now will help us meet the growing demands of our multiple campaigns, by hiring a new part-time organizer. For fifteen years CAGJ has confronted corporate power through the collective strength of our members and community organizing together. We have accomplished so much, and with only one full-time staff person! Now, to effectively coordinate our transnational organizing (which has already made the GM banana a high profile issue – check out this HuffPost piece), we need to expand. Our first goal is to hire a new Co-Director, and later this year we will hire an AGRA Watch Organizer. You can help us double our staffing in 2016 with your Membership donation! $5000 Matching Grant: With your gift, we can reach this goal, with the generous matching grant from grocery workers’ union UFCW 21, and several CAGJ Members! 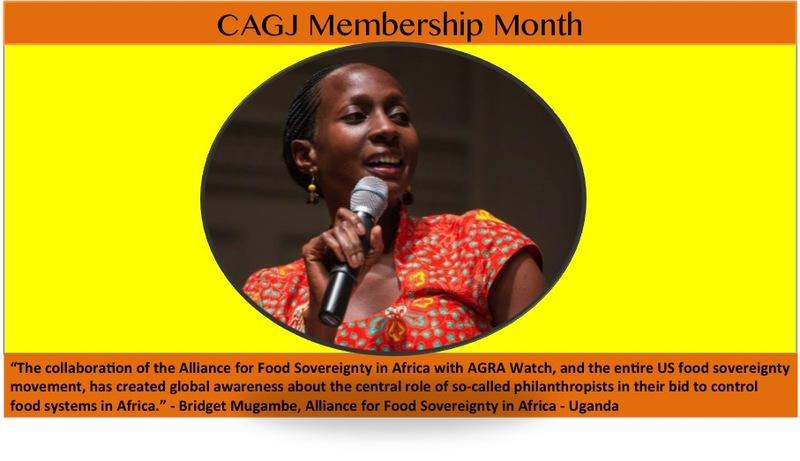 All donations up to $5000 through May will be matched, dollar for dollar, so donate now to ensure CAGJ can continue our transnational organizing for food sovereignty. Please consider becoming a Monthly Sustainer or providing a one-time contribution of $15, $50, or $125. Most of CAGJ’s revenue comes from individual donations. If you can’t donate funds at this time, but can pledge to participate in CAGJ over the next year, you too can sign up to become a Member (or renew)! THANK YOU for helping CAGJ thrive in 2016!